Our Geometry course includes lots of discovery. LOTS. As a result I have 55 kids who like to have a ruler and a compass at hand when they're asked to investigate anything. Which is totally fine and awesome. When they want to check if things are equidistant or sketch a circle and they're like "can you get out the compasses" my heart sings. I can't even tell you. If you didn't notice, take a look at those measurements and that diagram and you will see the problem. I did not think much about it, because diagrams are not to scale and perfect reasoning on imperfect pictures and blah blah blah. A few years ago my students wouldn't have batted an eye at this, they would have just plugged and chugged, but these guys were NOT. HAVING. IT. "What is going on with your diagram?" "This is not physically possible." This made me ridiculously happy. Just that they view the quantities we work with as physical things they can measure and verify and use their spatial intuition on. And they don't see them as arbitrary rules devoid of meaning that they have to memorize because the grumpy lady makes them. Maybe this is obvious and it just means that I'm now a mediocre Geometry teacher instead of the worst Geometry teacher ever. But, you know, baby steps. I may or may not have also shown them Rico Suave on youtube. It is the end of May. We are punchy. TI has some really decent investigations available on their Math Nspired website. The quality is a bit uneven, but there is some good stuff in there. However I keep finding things that look good on first read-through, and seem straightforward when I try them, but don't work so well with kids. 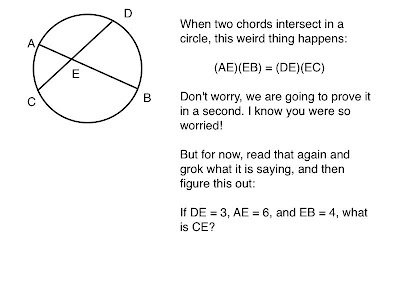 For example, their activity that explores arcs intercepted by central and inscribed angles. I am very grateful that they make the student investigation handout available as a Word document, so that I can edit the bejeezus out of it. Thank you for that, TI. The first thing I normally do is insert a problem-to-find after every big conclusion. They usually ask the student to summarize the finding in words, but "summarizing in words" often turns into "write some BS," at least with my tenth graders. They're just not sure what's expected, so they put some ink on paper and try to make it look good. Asking them to apply the concept to a problem right away really helps. 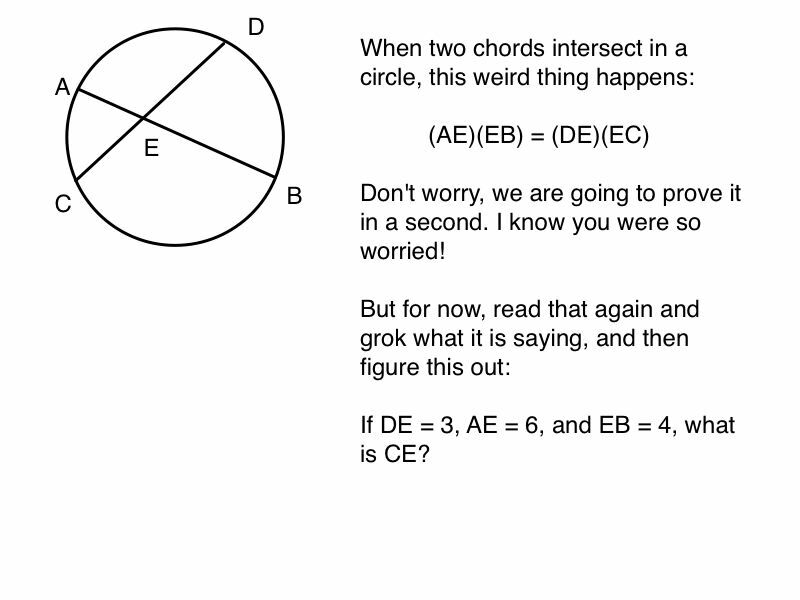 Another thing that was unclear was how they lead them to notice the relationship between a central angle and an inscribed angle, or the equivalent idea, an inscribed angle and its intercepted arc. Why didn't they put in another nice table, so the numbers are written out and staring them in the face? Were they trying to conserve paper? So I fixed that by adding in another table. So, conclusion... caveat emptor? There is some fine stuff in there. It just doesn't feel like it was tried out on kids before they published it. Or maybe it's just a case of how you can't really ever just adopt someone else's stuff wholesale without modification, but you have to work through it on your own, modify it, try it out with your kids, and modify it some more. I’m surprised by how many people have found me and I’m glad people find my ideas meaningful. I guess I’m just amazed at how easy it’s been to have a voice in the semi-anonymity of the internet. If you're just getting into teaching, there are plenty of worse ways to invest your time than in blogging, tweeting, and building your own faculty lounge. If you are in a room full of math ed bloggers and you don't remember someone's name, try "Dan." "...if/when you get the urge to move, the math department in _____ would love to talk to you. We always need great people with a passion for improving their craft (and especially doing so in such a public fashion.)" So, you know. For the past long while it seemed like admins and hiring-decision types paid no mind to my blogging. But that's changing. People are paying attention, and more importantly, it's people who value the same things we do: continuous learning, reflective practice, learning out loud. I was asked about specific posts on f(t) in the interview for my new job, which not only helped them get to know me, but heightened my opinion of them and their school as a promising place to work. Geometry: Wrapping up similar triangles including proofs, finding missing proportional sides, and the mean proportional. I finally gave up on an investigation I wanted to like so much I tried it for three years that I called Hands on the Mean Proportional. They would cut out two congruent right triangles, and then slice one at the altitude to make three similar right triangles, and then use the cut out shapes to investigate which segments were geometric means. The whole thing was just too confusing. This year I modified a more straightforward investigation originally created by a colleague here at school. It worked nicely. On the second day, we solved some by setting up a table of the three triangles and three sides to see which would make a proportion we could solve. Alg2/Trig: Finishing up statistics, which is basically standard deviation and the normal distribution. A new thing this year was I had students submit three survey questions they wanted all their classmates to answer. These had to go through a few revisions to remove ambiguity (for example, "How long does it take you to get ready in the morning?" turned into "How many minutes from when you wake up until you leave the house? "), and so that we would get numerical answers (for example "Do you use drugs?" turned into "What drugs have you tried?" turned into "How much money do you spend per month on drugs that are illegal for you to possess?") I whittled the questions down to the dozen or so most common ones, and all the students responded. I put each survey into its own Spreadsheet page on the Nspire, and sent the document out to all the kids' handhelds. Boom! I still did the remaining lessons with the required coverage as planned, but instead of made-up who-cares examples, we had all this interesting data to explore. We were able to grasp the meaning of sources of bias, standard deviation, histograms and box plots, and distribution functions in context. I think it really helped the cherubs assign meaning to the concepts. I know you are all dying to know how my work visa process is going. I mean, it's half of what I think about, so it must be important to everyone else too, right? Well, update: I no longer feel like a rat in an unsolvable maze. Now, I feel like Zeno. Every time I think I am one step away from having all the paperwork in order, I find out there are two intermediate steps that have to happen first. There's not a government official with a stamp at the town, county, or state level that I have not met in person. They are nice people, if a bit harried. Tip: the Onondaga County Clerks like donuts, but the Manlius Police prefer peanut butter cups. The New York State Department of State (yes, that's a real thing) are all on low-carb diets. The Syracuse Police do not like anything. In other moving news, my new school sent a list of things I should think about bringing or else live without being able to buy for the next year. (I'll save you lots of reading: clothes, shoes, OTC medicine, skin and hair care products, and peanut butter.) That threw me into a stress tailspin from which my pancreas has not yet recovered. I never thought I would be ordering luggage in bulk, but that seems to be the next step.